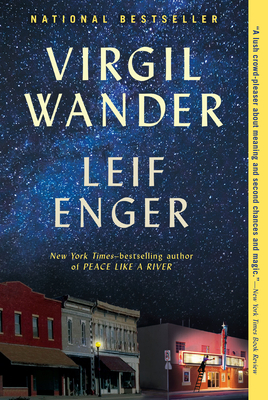 The first novel in ten years from award-winning, bestselling author Leif Enger, Virgil Wander is a sweeping story of new beginnings that follows the inhabitants of a Midwestern town in their quest to revive its flagging heart. Small town cinema owner Virgil Wander is "cruising along at medium altitude" when his Pontiac flies off a bridge into the icy depths of Lake Superior. Virgil survives but his language and memory are altered and he emerges into a world no longer familiar to him. Awakening into his new life, he begins to piece together the lore of his broken town with the help of a cast of affable locals. Into this community returns a prodigal son, Adam Leer, who may hold the key to reviving their hard-luck town. Carried aloft by quotidian pleasures of kite-flying, movies, fishing, baseball, necking in parked cars and falling in love, Virgil Wander is a swift, full journey into the heart and heartache of an often overlooked upper Midwest by an award-winning master storyteller.